Wendouree circuit of the Ballarat International Foto Biennale has been achieved — with added craft! 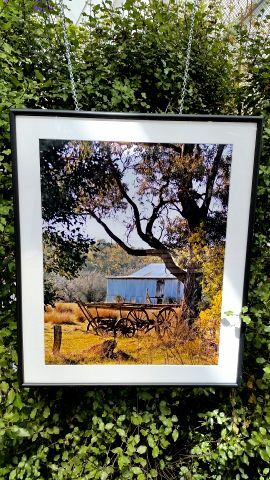 and finally, probably the day’s highlight, rural landscapes from Vanessa Brady on show at the Robert Clark Conservatory in the gardens. Brady also has some wildlife pictures, and also in the conservatory are sculptures by Kim Percy. A morning well spent, with plenty of variation and an admirable matching in most instances of theme to venue. 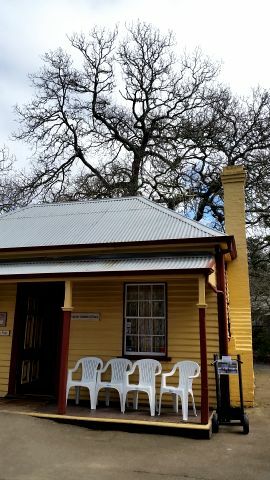 Also in the Botanic Gardens is the Adam Lindsay Gordon Craft Cottage, a store run by the Crafts Council of Ballarat occupying the relocated home of the intriguing poet (1833-1870). A wide selection of handmade giftware is on offer, including exquisite timber pepper grinders and cute door stoppers. The biennale runs until 20 September 2015. The cottage is open daily September-mid June, otherwise at weekends and public and school holidays. This entry was posted in art, out and about in ballaratia, photograph and tagged ballarat foto biennale, botanic gardens, craft, photography, wendouree performing arts centre. Bookmark the permalink.